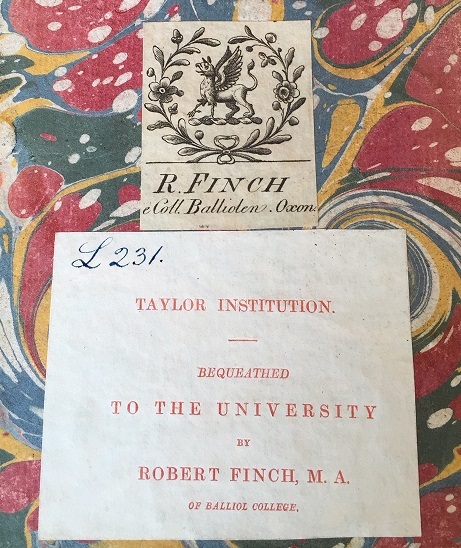 Finch’s library was housed originally in Room 3 of the newly built Taylorian and a catalogue of the books and manuscripts was published in 1874.3 Of the items retained by the Taylorian when the collection was dispersed in 1921, those that stood out as a group were the 33 different editions of Battista Guarini’s famous pastoral tragicomedy, Il pastor fido. 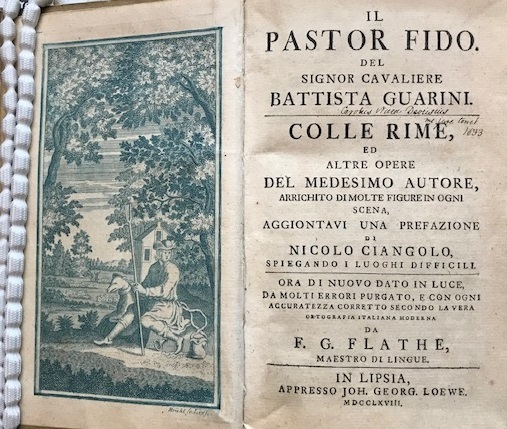 One edition was held in duplicate as having belonged to Finch’s wife Maria and it was these volumes from the Finch Collection which formed the original nucleus of the present collection of well over 200 editions. In Part I of this personal survey of my involvement in the growth of the collection during the 33 happy years that I spent in the Taylorian Library, I wrote of some of the joys and disappointments of collecting. And make no mistake, looking out for ‘new’ editions of the Pastor fido, whether for purchase by the Library or to add to my checklist of published editions of Guarini,4 has been a time-consuming affair and, as any enthusiast will tell you, such an endeavour can become something of a compulsive disorder. Under my watch the Library acquired some 80 editions of the works of Guarini, mainly of the Pastor fido, and since my retirement in 2004 I have persuaded the Library to purchase the occasional volume (15 to date). I have even resorted latterly to buying the odd one myself in order to present it to the Library as a thank-you for affording me the real pleasure of helping to enrich the collection, as a member of staff and as a retiree, over a period of many years. 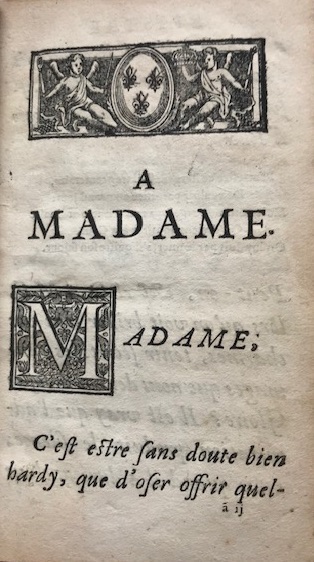 First, there was the curious case of a 1666 edition of the Abbé de Torche’s French translation of the Pastor fido, which turned out to be a curious hybrid, seemingly bringing together as it does the original sheets of the five individual parts, one for each Act, as issued from 1664 to 1666, but reconfigured in the form in which they appear in the reprinting of the whole translation from 1667 onwards, with the dedication of Act V, A Madame, acting as a general introduction to the whole work but minus the other dedications and the plates. Odd indeed, but interesting. Next up was a copy of the 1828 Cremona edition of the text as issued in its original publisher’s casing. (Too often in the past binders destroyed much that is interesting from the bibliographer’s point of view.) Both these items have now been donated to the Library but there are two more which I have acquired and which I shall deposit ere long. 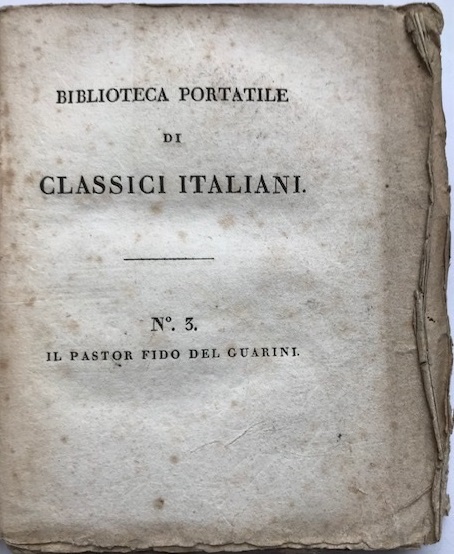 The first is an untrimmed copy (volume 1 only, alas, of 2) of the 1819 Zwickau edition in its original printed paper wrappers. And then, only in March of last year, I discovered an edition of the Pastor fido with the imprint ‘In Venezia, presso Gio. 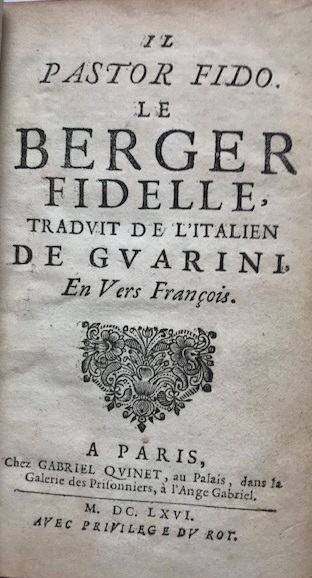 Battista Ciotti, 1664’, the first time in more than 45 years of investigation that I had come across such an edition. The seller was living in Modica in Sicily, a town more famous for its bitter chocolate and its occasional appearance in the Inspector Montalbano films on television than for its antiquarian books, but, if you like, this would be the chocolate on the icing on the cake of my quest for editions of Guarini’s play. If all is as it seems. The binding, which appears to be contemporary, is a little careworn but, then, so would you be after 350 years. 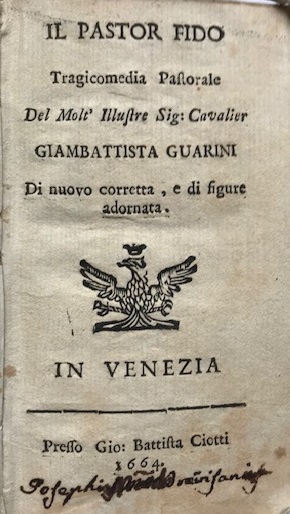 The imprint is obviously spurious, as Ciotti, who had been publishing works by Guarini since 1593 and of the Pastor fido since 1600, had died round about 1627 and, although works bearing the family name were published by his sons up to at least 1638,5 the date of 1664 would be a fascinating echo of his continuing prestige in the world of publishing. 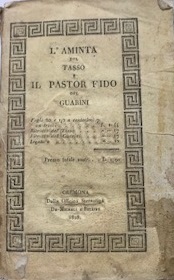 There is another 1664 edition of the Pastor fido, that printed in Rome by Francesco Moneta and sold by Bartolomeo Lupardi in the Piazza Navona. It has the same number of pages as the ‘new’ Venice edition and an enquiry of the library of the Gottfried Wilhelm Leibnitz University in Hanover, which holds a copy, confirmed that the setting of the text is identical, so what we are dealing with here is, in theory, a reissue of the Rome edition with a cancel title printed for the Venice market. And yet, and yet… We show here a copy of this so far unique title-page. Is my Shepherd still faithful or has he, after all these years, become infido and false? Someone will perhaps recognize and identify that very prominent ornament. 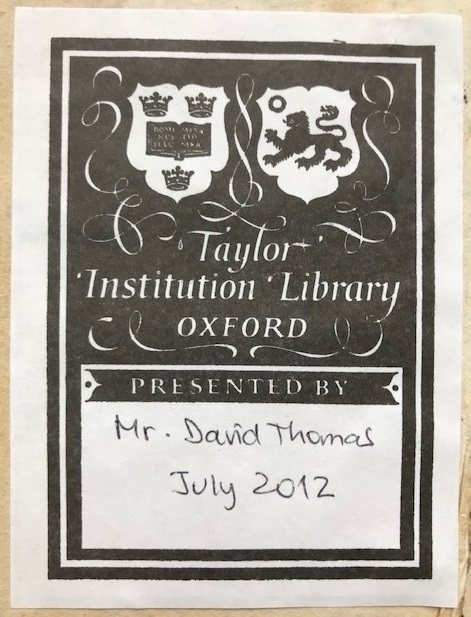 Of the 470-odd verified editions of the Pastor fido recorded in all his guises, the Taylorian can account currently for nearly 220, with the Bodleian and college libraries chipping in a further 30 or so, a wholly satisfying total, even if, through the ravages of time, a small number of them are imperfect. But, then, ‘there is no real beauty without imperfection’ (James Salter). And do I have a favourite, I hear you ask? 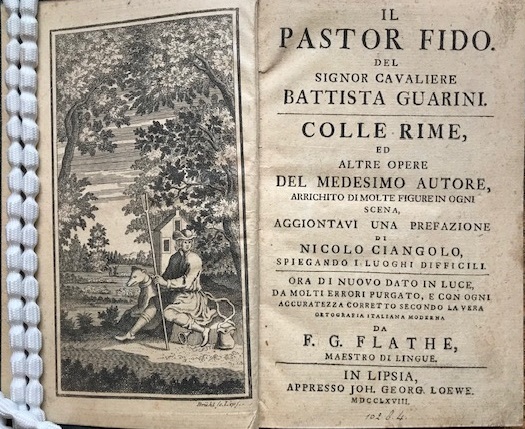 Well, apart from my apparent unicum, I suppose it has to be the 1768 edition of the Pastor fido, published in Leipzig by Johann Georg Loewe and purchased by the Library in 1976. 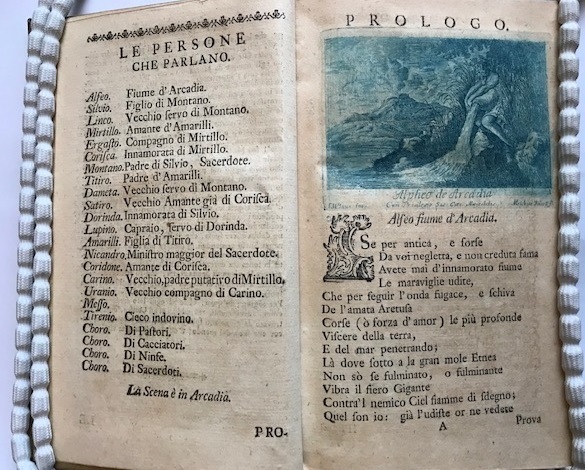 The frontispiece and the 42 vignettes in the text are here printed in blue, ‘stampate con inchiostro turchino’ the bookseller’s catalogue said. 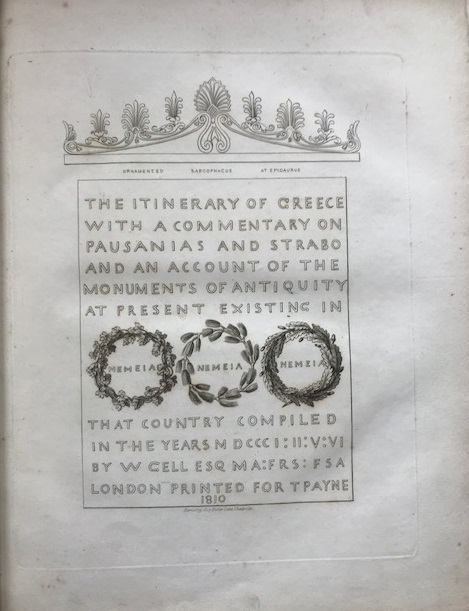 The Library also has the more usual issue where the engravings are printed with black ink but, if you want to see the other issue in all its glory, the Taylorian’s copy has been digitized and you can download PDFs of both editions here. 1 See the entry in the Oxford Dictionary of National Biography (Oxford: OUP, 2004) (Published online 23 September 2004 [accessible within the University network only]). See also Elizabeth Nitchie, The Reverend Colonel Finch (New York: Columbia University Press, 1940) and E.R.P. Vincent, ‘Robert Finch and Enrico Mayer’, Modern Language Review, XXIX (1934), 150-155. 2 Intriguingly, the volume bears the signature of another of the Library’s benefactors, Marshall Montgomery (1880-1930), Reader in German in the University, who acquired the book in 1925. 3 George Parker, A catalogue of the books in the Finch Collection, Oxford. Oxford: E. Pickard Hall and J.H. Stacy, 1874. The Bodleian copy of the catalogue (2590 e. Oxf. 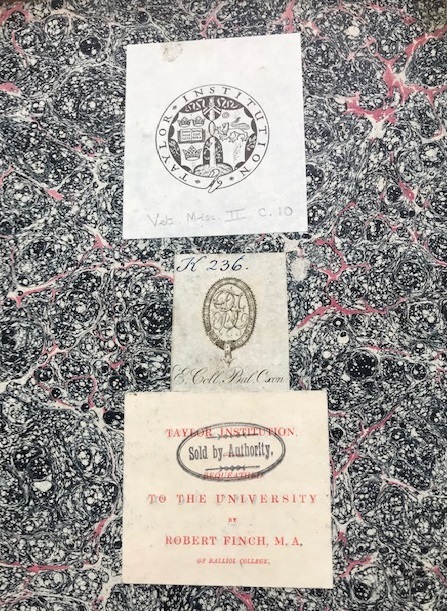 10.3) is annotated and, although most of the Guarinis are marked as being not in Bodley, they were all destined to be kept in the Taylorian when the collection was dispersed. 4 David H. Thomas, An annotated checklist of editions of the works of Battista Guarini. Oxford: Taylor Institution Library, 2014. A contemplated further revision of the checklist will reveal the most recent metamorphosis of my Faithful Shepherd as the Polish Wierny pasterz, in a translation by Marta Wojtkowska-Maksymik (Warszawa, 2018); this, too, will join the collection shortly. 5 Dennis E. Rhodes, Giovan Battista Ciotti (1562-1627? ): publisher extraordinary at Venice. Venezia: Marcianum Press, 2013. 6 See an article by David Sanderson in The Times, 5 November 2018, ‘Mini book format swiped from phones,’ p.19. 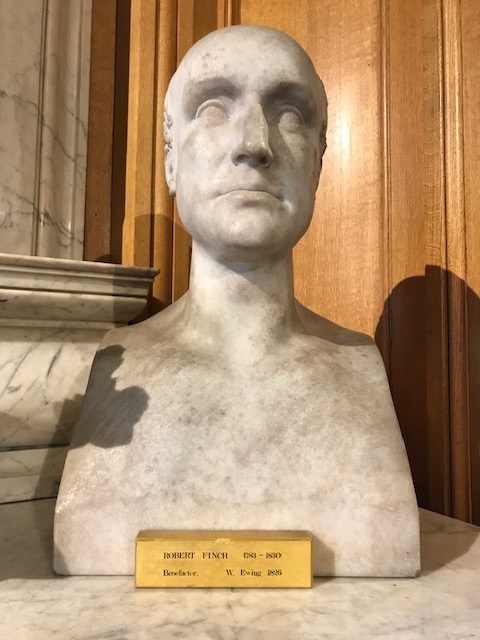 This entry was posted in History of the Library, Special Collections on 15 March 2019 by Clare Hills-Nova.